Looking along Church Street towards the Pepperpot and the High Street in the mid 1930s, from roughly outside Cornmeter. The arch on the left, which used to lead to the yard of the Angel Hotel, is Deanery Yard. The sign advertises lock up garages. Net curtains were hanging at the windows of the premises next door; today the shop sells gifts. On the curve of the road on the left is the Skinner's Arms (also see Old Town Hall, Godalming, 1907) and its oval sign advertised Sandeman and Courage. The beerhouse had been part of Farnham United Breweries Ltd. but in 1927 the directors entered into a provisional contract with Courage and Co. for the sale of their shares at the price of 25s for each Preference and 45s for each Ordinary share, payable in cash. It continued as a beerhouse until the 1950s but was then converted into shops. The brewery's sign is still painted on the building. If you look up to just below the roof line but above the first floor windows are the words "Courage Alton The Skinner's Arms". Looking down Church Street from the High Street is an estate agents, Clarke Gammon Emery. The shop signs on the right are harder to read, but of the two signs where the road bends and where someone is walking the top one proclaims The Pepperpot (presumably a cafe) and lower down advertised Ices. Closer to the camera, and still on the right, a man is walking away; he has just passed the junction of Mint Street and Church Street. Church Street has, in recent years, featured in the film "The Holiday". 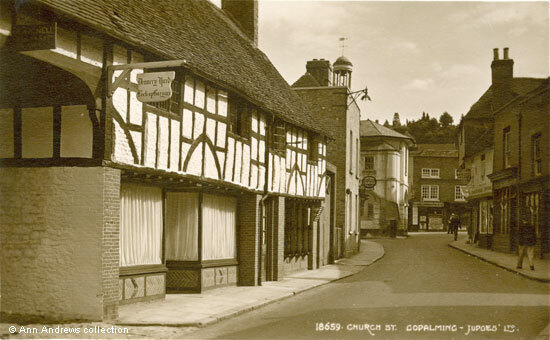 "Church Street, Godalming". Judges Ltd., Hastings, No.18659. [1935-6] Not posted. "Western Daily Press", Tuesday 12 April 1927. Company News. Farnham United Breweries. Janaway, John (2003) "Godalming and Farncombe Pubs and Breweries", Ammonite Books, Godalming, Surrey. ISBN 1-869866-14-2. Janaway says the King's Arms and Skinner's Arms were both sold in February 1957.